The moon has 4 phases -- now there’s a moonflower effect from American DJ that lights up the night using 4 distinct colors in one LED source. Fittingly called the Quad Phase, this revolutionary LED moonflower can mix and blend nearly twice as many dazzling colors as you’ll find in a rainbow, 13 in all – red, blue, green, purple, yellow, cyan, white, light red, light blue, light green, light purple, light yellow and light cyan. This multicolor extravaganza is made possible by the Quad Phase’s technologically advanced 10W quad-color LED module, which contains 4 different color LED components (red, green, blue and white) in one homogenized lamp source, allowing it to mix up a larger variety of hues. In addition to creating more colors, this 4-in-1 LED produces smoother color changes and eliminates the shadows and halos sometimes associated with LED effects. A high-power club and DJ effect, the Quad Phase emits a total of 160 brilliant, razor-sharp beams at a 65° angle, enough to fill a dance floor, wall or ceiling with a spectacular shower of color. Utilizing state-of-the-art 1.8° long-life stepper motor technology, the versatile moonflower can produce either quick accurate movements for high-energy dance tracks or a smooth fluid motion to complement mood music. And with a large palette of colors to choose from, there’s a shade to match every mood! 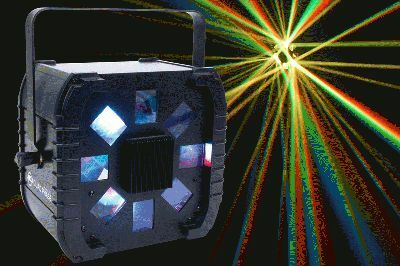 Compact and easy to use, the Quad Phase is great for mobile entertainers, discos and small clubs. It can be run in 3 different modes: Sound Active, Master/Slave (linkable via 3-pin cable), or DMX-512. When operated in Sound Active or Master/Slave modes, the Quad Phase will move to its own exciting built-in programs, producing an electrifying, colorful light show with virtually no effort. Or you can create your own customized light show with a DMX controller, using 4 channels that give you full command over color, rotation, strobe and dimmer. A 4-button display on the rear panel makes it easy to navigate through DMX settings. The Quad Phase’s light show can go on all night too, thanks to its cool-running LED lamp source, which emits such a small amount of heat that there’s no need for on/off duty cycles. This cool operating temperature also keeps things more comfortable on the dance floor, and allows you to pack up the fixture right after your show, since it’ll never be “too hot to handle.” Other advantages of the Quad Phase’s LED lamp are its long life (30,000-hour rated) and low power draw. Despite producing a brilliant rainbow of colors, the unit is “totally green,” consuming just 27 watts of electricity at maximum use. Designed for easy mobility, the Quad Phase measures just 7.5”L x 12”W x 13.25”H/189 x 306 x 334mm and weighs only 9 lbs./3.8 kg. Featuring multi-voltage operation, it can be taken virtually anywhere. Offering a lot of moonflower for the money, the Quad Phase has an MSRP of $279.95.